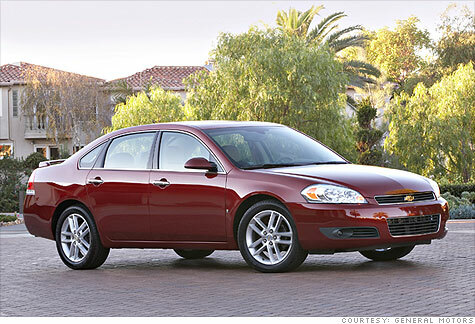 NEW YORK (CNNMoney.com) -- General Motors Co. said it is recalling 303,100 Chevrolet Impalas because the vehicles' front seat belts may not properly protect passengers. The automaker said that in in 2009 and 2010 Impalas, the front safety belt straps may not be not secured to the lap belt anchor pretensioner that is mounted on the side of the doors. The straps can separate from the anchor in a crash, no longer restraining the passenger. No injuries or deaths have been reported, GM said. GM dealers will mail notifications to customers by Oct. 25 to bring in their cars for an inspection and if necessary, they will reinstall the seat belt anchors for free. In June 2009, GM investigated nine reports of seat belt warranty repairs that noted the separation. GM initially believed that the condition was confined to models built between July 2008 and September 2008. But after receiving additional reports, GM assigned a product investigation engineer to review the issue in July 2010. As of mid-August, the company had received 32 reports of seat belt straps separating from the anchors during vehicle use. Smart car: Is it the next Saturn?